Domestic air traffic clocked an excellent 23.33% growth in April 2015, with the scheduled domestic airlines carrying 65.59 lakhs (6.56 Mn) domestic passengers during the month, according to DGCA released data. With this, total domestic passengers during the period of January to April 2015 reached 251.05 lakhs (25.1 Mn) growing by 21.28% over 207.00 lakhs (20.7 Mn) passengers flying during the same period last year 2014. Air India carried 10.65 lakhs (1.06 Mn) passengers during the month with the eight private carriers collectively carried 54.94 Lakhs (5.49 Mn) passengers. These private carriers cornered 83.76% of the total passengers market with Air India taking 16.24% market share. 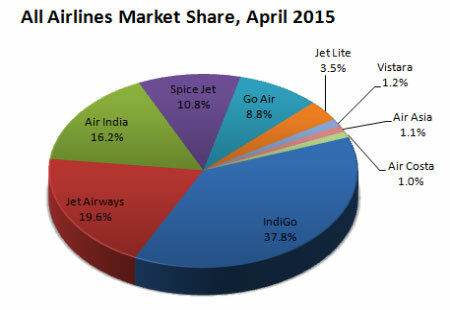 IndiGo further strengthened its lead among all the scheduled domestic carriers with 37.8% market share in April 2015. The airline flew 24.81 lakhs (2.48 Mn) passengers during the month. Jet Airways flew maintained a distant number two spot flying 12.86 Lakhs (1.29 Mn) passengers and securing 19.6% market share. Air India was at third position, while Spice Jet increased its market share slightly to 10.8% carrying 7.07 Lakhs (0.71 Mn) passengers. GoAir steadily maintained its share at 8.8% carrying 5.74 Lakhs (0.57 Mn) passenger during April 2015. These four top players collectively commanded 84.45% of the total domestic passengers market in India. Jet Lite flew 2.29 Lakhs passengers and had secured market share of 3.5%. 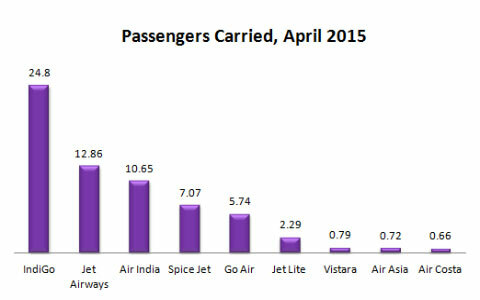 Vistara pushed itself up two positions to 7th position carrying 0.79 lakhs passengers and securing a market share of 1.2%. Air Asia flew 0.72 lakhs passengers with 1.1% share. Air Costa bottomed with 1% market share, carrying 0.66 lakhs passengers. The private carriers� competitive space IndiGo was leading at the top with a very big margin and a huge market share of 45.16%. Jet Airways at the second place had 23.41% share. 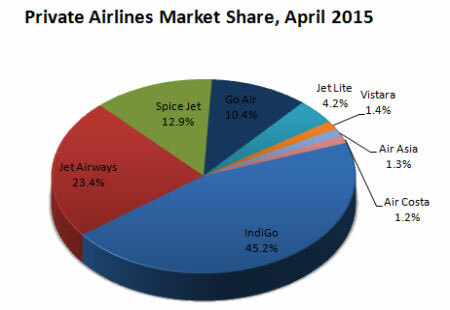 Spice Jet secured a third spot with 12.87% share while Go Air was at fourth with 10.45% market share. The collective market share of these top four players in the private carriers� competitive space was 91.88%. Jet Lite, Vistara, Air Asia and Air Costa respectively secured 4.17%, 1.44%, 1.31% and 1.20% of market share.